(NaturalNews) A small deciduous tree or large shrub that bears fruit, the Punica granatum, commonly known as the pomegranate, is a superfood with a long and rich history. Native to the East, it can be traced through historical documents as far back as 4000 B.C. The red fruit grows from pretty red flowers and is between a lemon and a grapefruit in size. The white flesh inside the thick skin is full of several hundred seeds. Pomegranates are grown as both a fruit crop and as ornamental trees or shrubs for parks and gardens. They are tolerant of drought and moderate frost, growing in climates similar to the Mediterranean region, California, or Northern India. There are many genotypes, with the differences ranging from exocarp and aril color, hardness of seed, fruit size, juice content and astringency, and so on. The pomegranate has become increasingly popular in the countries of North America over the last few decades. The name pomegranate comes from Medieval Latin meaning "seeded apple." It has been named in many ancient texts from the Book of Exodus in the Torah, the Quran, the Homeric Hymns, and Mesopotamian records, to name a few. The pomegranate originally came from Persia, or modern day Iran, and the western Himalayas. It has been cultivated for millennia in places such as Iran, Iraq, Afghanistan, Pakistan, India, Russia, and the Mediterranean region (http://en.wikipedia.org/wiki/Pomegranate). It migrated as far east as China and Southeast Asia and was found along the Silk Road as a symbol of abundance and posterity. It is also grown extensively in Korea, Japan, and Latin America, having been introduced there by settlers or traders. Other ancient sightings of the pomegranate include on the pillars of the Solomon's temple in Jerusalem, on the robes of Jewish priests, and in mosaics from ancient Rome (including Pompeii) where it was called the "Phoenician apple." Its twigs were worn on Roman women's headdresses to signify marital status. In Zoroastrian temples, pomegranates were used to symbolize eternal life and were associated with fertility. A symbol of strength in ancient Persia, the army of Xerxes carried spears with pomegranates on the tip (instead of spikes) when they invaded Greece in 480 BC. (http://www.foodreference.com/html/a-pomegranate-history.html). Pomegranates were also depicted on the walls of the royal palace and fortress Alhambra of the Islamic Nasrid Dynasty by the Moors in Spain. They even renamed one of their cities after the fruit. It also has a place of significance in Armenian culture. More than just a nutritious food source, the pomegranate was an integral part of many cultures. In many cases, the pomegranate surpassed its status as a highly celebrated source of food, and became part of the lore and legends of a culture. It was celebrated by the Buddha, and was considered one of the three blessed fruits, often being represented in Buddhist art. It was also depicted on the Temple of the Founder of Zen, to honor Bodhidharma. Another example is how prominently the pomegranate was featured in Greek myths (approximately 500 BC). Most of us remember how Hades tempted Persephone with a pomegranate, and when she partook, it bound her to him as pomegranates symbolize the indissolubility of marriage. This is how Greek legend explains the seasons: when Persephone is in the Underworld with her husband, it is winter; when she rejoins her mother every year, we have spring. As the pomegranate made its way to Europe, it had become more of a symbol than a food, and was portrayed regularly in art, literature, religion, and mythology. Eventually the western cultures come to value the pomegranate for its medicinal properties, and it was featured in heraldry, being found on the heraldic crests of many medical institutions including the British Medical Association (http://www.pomwonderful.com/about/pomegranate-history-legend/europe/). As it spread throughout Europe, the pomegranate came to appear on several coats of arms and symbolize noble birth. The pomegranate made it to the new world via Spanish missionaries. When Cortez conquered the Aztecs in the 1500s, pomegranate trees were planted in Mexico, then made their way north to missions in California and Texas. It spread across the south but did not do well in the northern climates. In 1771, Thomas Jefferson planted pomegranates at Monticello, his plantation in Virginia. Around the year 2000, pomegranate popularity began to grow again as this sweet, juicy, succulent fruit was rediscovered. It's availability around the United States increased as a result. Some miscellaneous uses of pomegranates many may not know include that it is often used as a bonsai tree and that pomegranate juice is sweetened and thickened to make grenadine syrup for cocktails. Throughout most of recorded history, our ancestors have had high regard for the pomegranate. 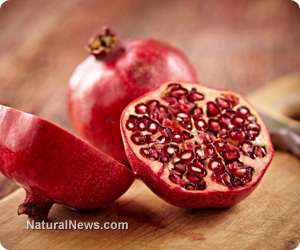 Its immune boosting phytonutrients have shown to be an effective tool in preventing degenerative and inflammatory ailments such as cancer, heart disease, and arthritis (https://www.naturalnews.com/031068_pomegranate_superfood.html). Current research underway includes studies on how pomegranate components affect diseases such as diabetes, cancer, rhinovirus, the common cold, coronary artery disease, kidney disease, and brain injury.